E-Commerce merchants are used to rely on digital media like Google and Facebook to drive traffic, while physical retailers are leveraging print and broadcast media for advertising & promotions. With the rise of smartphone usage, any media for this specific outreach is very much sought after. Mobile messaging apps like LINE is one of them. Instead of being "just a messaging app", LINE is transforming itself to a lifestyle platform, similar to how brands like Apple, Amazon are building their ecosystem. Due to its mobile, instant and rich features, LINE is a very effective marketing platform for merchants (both online and offline). Although we have seen more and more brands are pushing campaigns via LINE yet it is still a "black box" for many. Here we are going to reveal the tricks behind, on 6 ways to run LINE marketing campaign. 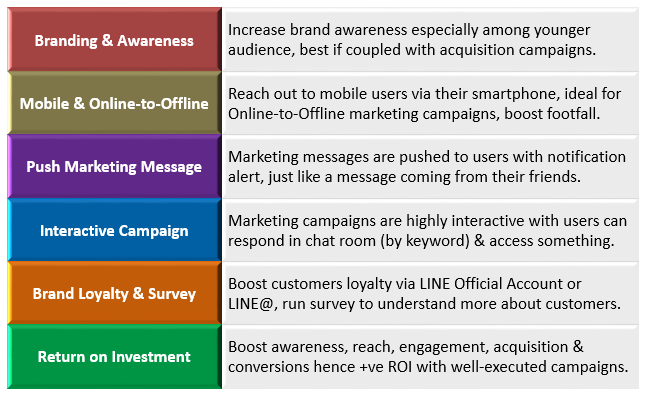 Before that, do take a look at the table below to understand the main advantages of LINE as a marketing platform. 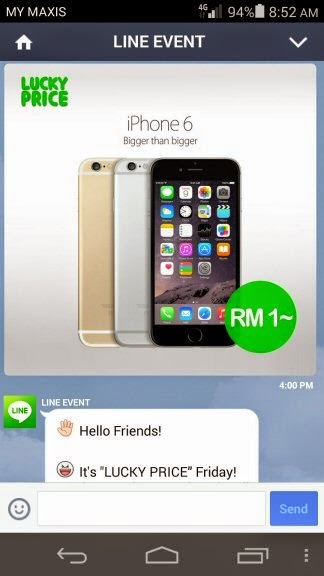 Read also: (Infographic) How LINE contribute to #MYCyberSALE? This is the most straight-forward campaign promoting flash sale or sign-ups. Offer exclusive, limited time only or in short bold promotions will most likely bring you immediate traffic or leads. We have seen past performance of 3 to 5 figures conversions, be it no of orders or no of sign-ups. Not many media out there can deliver similar instantaneous results. 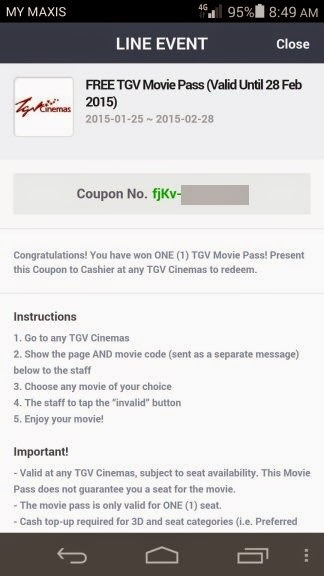 Both LINE Official Account and LINE@ can utilize the "Coupons & Promo" feature to distribute vouchers to all followers, or by probability % (and maximum quantity to be allocated). This is also very useful for Online-to-Offline campaigns, where as your point-of-sale staff can tap on the "invalidate" button upon redemption. 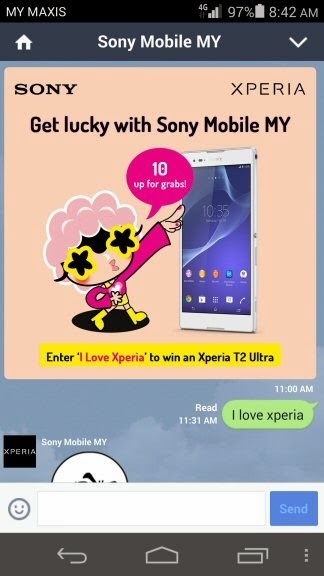 By using keyword reply, you can execute "Lucky Chance" campaign on LINE. Users can reply with the pre-defined keyword in the chat room, and if entered correctly they will be able to get access to the reward. You can execute this kind of campaign with other creative ideas, for example trivia, or set chances (probability) of winning. As opposed to Lucky Chance, this is the reverse way whereas your followers need to purchase something from you (either online or offline), get a special code and enter it in the LINE chat room. 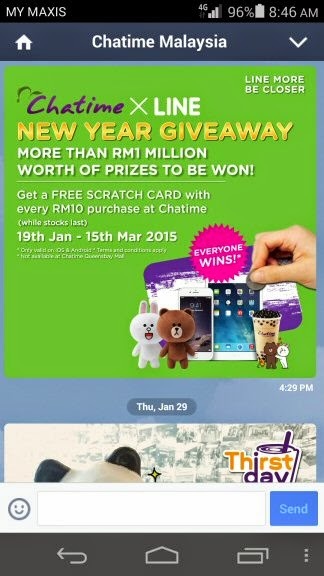 We have seen "Scratch & Win" contest being promoted by local retailers recently. Customers will be given a scratch card with purchase above a certain threshold, enter the code in LINE and entitle to win prizes. Not to be confused with Lucky Chance, Lucky Price is basically name your "lucky price" to buy something (usually premium gadgets). This is similar to bidding mechanic but the lowest unique bid (not highest) will get the chance to buy the unit at the bid price. Three bid chances will be given by default, where as you need to share this with your friends to acquire more bid chances. This campaign is best for electronics retailers or brand owners. 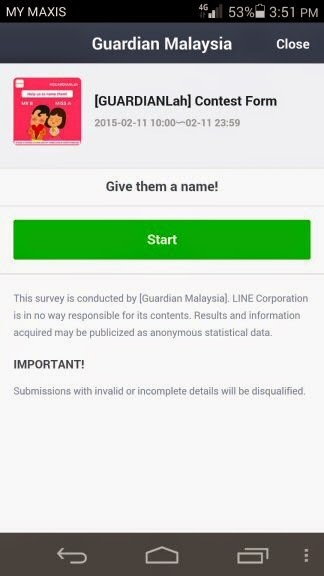 LINE Official Account and LINE@ account owners can utilize the "Polls & Surveys" feature to run interactive surveys. Survey forms are designed such a way that it is user-friendly to enter information on a smartphone. You can use this feature creatively to run contest too. This is a very effective tool to collect data and understand more about your followers. ecInsider: LINE marketing secrets revealed!